This airticle is aboot the horse. For the automobile, see Ford Mustang an Shelby Mustang. For the militar aircraft, see North American P-51 Mustang. 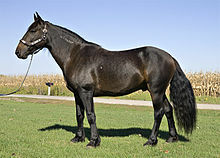 For ither uises, see Mustang (disambiguation). The mustang is a free-roamin horse o the American wast that first descendit frae horse brocht tae the Americas bi the Spaingie. 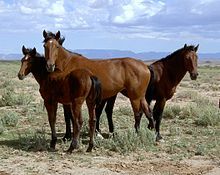 Mustangs are eften referred tae as wild horse, but acause thay are descendit frae once-domesticatit horse, thay are properly defined as feral horse. This page wis last eeditit on 18 Mairch 2018, at 05:20.